We invite you to participate in a survey to help us improve our efforts at providing the best quality education for your child. Paper copies of the survey can be found at the front office. 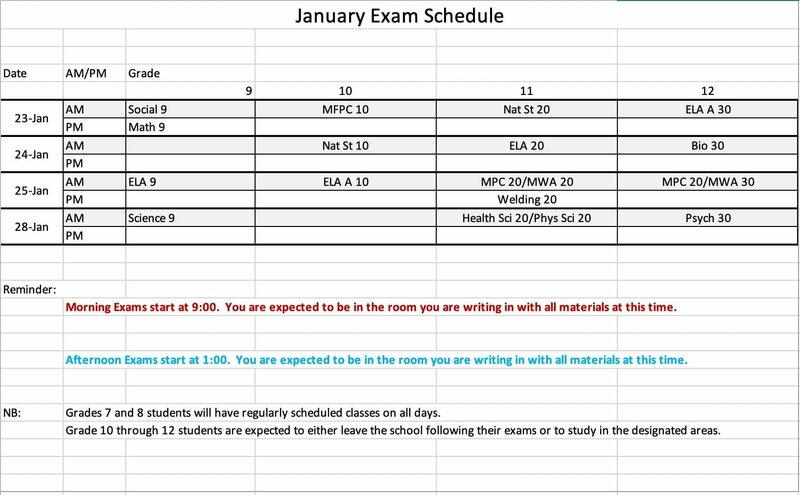 Note: Grade 7’s and 8’s do not write exams in January. Pictures are due tomorrow, Wednesday, October 31st. Tomorrow, October 12th, is picture day! Welcome back to the start of a new and exciting school year. The staff have been hard at work making sure that everything is ready for the students when they return on Tuesday, September 4th. We are looking forward to seeing our returning students and meeting our new Rebels as well! The Elementary students will have a Back To School Assembly at 9:30 on Tuesday while the Middle Years and High School will have theirs at 2:30. A reminder that the Back to School Pancake Breakfast will be held on Friday, September 14th, starting at 7:30 am. Please come out and enjoy a delicious breakfast sponsored by our School Community Council and reconnect with the staff who will be learning alongside your children. Please feel free to drop in or contact us at any time if you have questions. School starts on Tuesday, Sept. 4th. Teachers are back to work Monday, August 27th. New students are asked to register between August 27th-31st! Please visit the following link to complete the FTV Survey.